Henry Benedict Stuart, Cardinal York. The last scion of the Stuart dynasty and the second son of James Francis Edward Stuart and Maria Clementina Sobieski was born on 6th or 21st March, 1725, at the Palazzo Muti, Rome. The same day he was christened Henry Benedict Maria Clement Thomas Francis Xavier by Pope Benedict XII at the Pallazo Balestra. 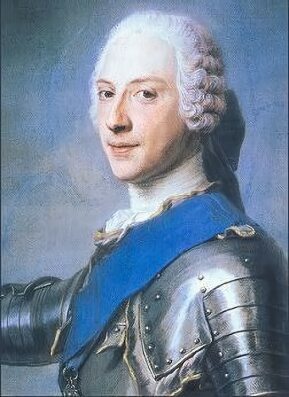 Styled Duke of York from birth, Henry was an intelligent child and was reported to have written and spelled better than his elder brother Charles Edward Stuart, known to history as Bonnie Prince Charlie. Clementina Sobieski's younger son seems to have inherited some of his mother's obsessive nature. When he was around seventeen, Henry raised concerns when he appeared to become increasingly preoccupied with his religious devotions. He was said to be "in constant inquietude for fear of not having time for all he ought to do". He was constantly checking his watch to make sure not a minute was wasted. Henry Stuart was a good-looking young man, with the same dark eyes as his brother Charles, but lacked Charles' height. In common with his father, he was more introverted, cautious and certainly less high spirited than his ebullient older brother. During the '45 rebellion he travelled to France to solicit aid for his brother's expedition from Louis XV, which he found an humiliating exercise. Henry was present to greet Charles in France on his return from Scotland, the brothers embraced each other warmly and at first seemed to continue in the close and affectionate relationship which had previously existed between them. They were soon to find that they no longer had much in common and Charles' supporters aggravated matters by complaining they felt that Henry not done enough to ensure that the French fleet sailed for England to support the rebellion. The sensitive Henry himself considered such criticism unfair as he had been appointed nominal commander of the French fleet but possessed no real authority. The brother's relationship was further adversely affected when on his return to Rome, Henry pursued his ambition to become a Cardinal in the Catholic Church. Although he had the full support of his father in his planned enterprise. Charles much aggrieved, felt strongly that his brother's chosen career had weakened his own position in view of the staunch Protestantism of the majority of the English people. Henry was ordained as a Cardinal Deacon on 30th June, 1747 and Cardinal of Santa Maria, Portici, on 3rd July, 1747, before being ordained as a priest on 1st September, 1748. He became known as Cardinal York and made himself extremely wealthy and influential in the curia. He later entered into a homo sexual relationship with a priest named Lescari, which horrified his father and was to be the cause of a serious breech between them. James demanded the dismissal of Lescari from his household, Henry stubbornly refused, James found the entire issue repulsive and reacted by ordering Henry to leave. The result was total estrangement between father and son. They were eventually reconciled a few years later. 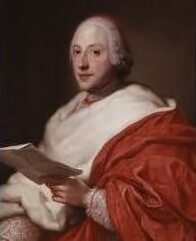 In 1761 Henry was appointed Cardinal Bishop of Frascati, where he lived for many years, he founded a seminary which he endowed with an excellent library and carried out his duties conscientiously. Cardinal York is still remembered in Frascati for his many acts of charity. After the death of their father in January, 1766, Henry affected a reconciliation with his errant elder brother and Charles at last returned to Rome to take up residence in the Palazzo Muti. They were never to see eye to eye over a number of issues, Henry was censorious about his brother's fondness for the bottle and frequent differences of opinion ensued. Henry was reluctant to meet his niece, Charles illegitimate daughter, Charlotte Stuart and protested when Charles granted her the title HRH. He was later to develop a close relationship with Charlotte and she became became instrumental in bringing about a reconciliation between the brothers. On the death of Charles, Henry inherited the Stuart claim to the throne of Britain. He declared himself Henry IX, but in acceptance of the situation, did nothing to press his claims. Although Cardinal York inherited a large amount of money and jewels from his Sobieski grandfather, after the French Revolution, many of his benefices and revenues were confiscated and Henry was obliged to sell off the Sobieski Jewels to support his lifestyle. In 1798, when the French occupied Rome, he was forced to flee to Naples. loosing much of what he had retained. For many years he made vigourous attempts to regain from the British government the dowry of his paternal grandmother, Mary of Modena, the Italian Queen of James II, but despite repeated promises to look into the matter, the British government failed to return the money. The Hanoverian King George III took pity on the sad predicament his distant cousin had been reduced to and granted him a life pension of £4,000 for which Henry was duly grateful. Henry Cardinal York, last of the ancient royal House of Stuart, died on 13th July, 1807, at Frascati and was buried with his father and brother in St. Peter's Basilica within the Vatican. Although the Stuart dynasty was now extinct, the Stuart claim to the throne descended to the next in line to the title, Charles Emmanuel of Sardinia, the great-grandson of Henrietta Anne, the youngest daughter of Charles I. The executor of his Henry's will, Angelo Cesarini, returned several of the Stuart jewels to King George III, these included a lesser George, reputed to have been worn by Charles I at his execution and now at Windsor Castle, the St. Andrew Jewel made for James II and now on display at Holyrood House and a ruby ring. The Stewart Sapphire, which had been owned by the Royal House of Scotland for centuries, was also given to George III. The original owner of the sapphire was reputed to have been King Alexander II of Scotland, who had it set into his crown for his coronation in 1214. Edward I of England took the sapphire along with the Stone of Scone in 1296, during his invasion of Scotland. His grandson, King Edward III, later returned the jewel to his brother-in-law David II of Scotland. King David II presented the sapphire to his sister, Marjorie Bruce. Marjorie later married Walter the Steward, her son was Robert II, the first monarch of the House of Stewart. On the accession of James I and VI to the throne of England, the sapphire returned once again to England. Oliver Cromwell sold the jewel along with the rest of the British Crown Jewels, during the Interregnum. After the Restoration, the sapphire was returned to Charles II. The sapphire is recorded as being part of the Stewart relics taken by James II to his exile in France when he fled the country on the invasion of William of Orange. 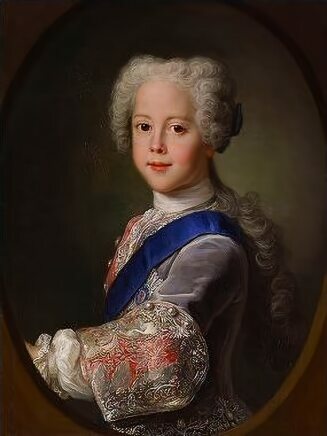 After James' death it passed to his son, James Francis Edward Stuart, the 'Old Pretender', who gave it to his second son Henry Benedict, Cardinal York. In 1838 the young Queen Victoria had the jewel set into the new Imperial State Crown, it was positioned at the front, below the Black Prince's Ruby. 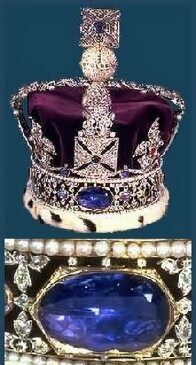 When George VI had a new Imperial State Crown made, which was almost identical to the old one, the Stewart Sapphire was set in the new crown. On the acquisition of the Cullinan diamonds, the Stewart Sapphire was moved to the rear of the crown to make space for the cushion-shaped Cullinan II. George IV contributed fifty pounds toward the cost of a memorial to the rival Stuart dynasty at St. Peter's Basilica in the Vatican. The Stuart Papers were later purchased for the Royal Library.